Dealing with a lot of stress lately? finding that it's having a negative effect on your body? 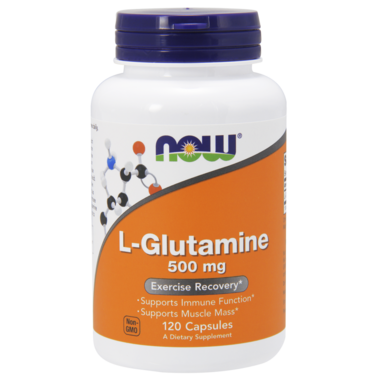 Glutamine can help minimize those symptoms of stress until they are able to subside altogether. Suggested Usage: As a dietary supplement, take 1 capsule 1 to 3 times a day, preferably between meals. I've been using this brand for quite some time. I use it for my leaky gut syndrome and you really can notice a difference in your digestion and bowel movements! An essential for anyone with leaky gut or digestive problems. And the price is right! I am taking it for a few weeks because of my "leaky gut" and its correlation to my Wegerner's disease , I am going through chemotherapy right now and try to take all the alternative additional supplements to support my body on a more natural level like L-Glutathione, Probiotic , Folic acid, Chlorella. It is too early to see the effect but what I can say is that I still have my hair and I have more energy. Will try to add another review later on. This is great for when you feel your blood sugar drop - or when you realize all of a sudden that you have an intense craving for something sweet. This is why I bought it, but I really wasn't sure it would work. But it does!!! Doesn't anyone notice the mental benefits of this, especially before sleep? Works a charm. Good product when you are recovering and beginning to exercise again! Good product! I use on daily basis to help with exercise recovery.